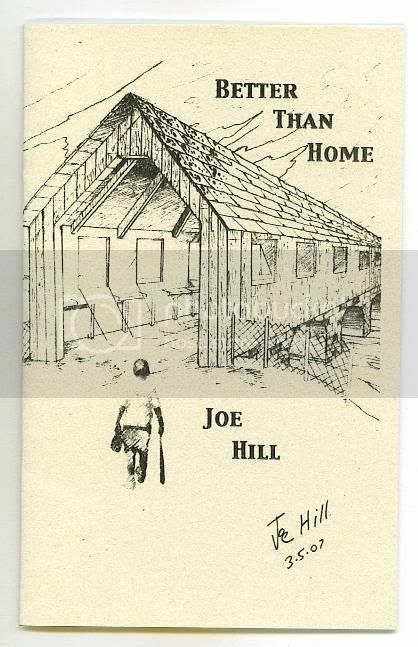 Hey guys, I just noticed some one on Abebooks.com is selling 3 copies of the 1st printing of Better Than Home signed by Joe for $250. If you look at the picture, it has the same signature my forged books have that came from kickbuttbooks. Also the seller right below the $250 version is also selling a signed copy. There is no picture, but it supposedly has the same signing date of 3-5-07. Here is the picture of the signed Better Than Home they are selling. Thanks Chris...not that I'd have $250 to spend on it anyway, but I have to say if I did and I bought this I'd be screaming mad! Someone should report these people. This is fraud, pure and simple. Thanks for the warning. It angers me, but at the same time I guess I'm immune to it. There are fakes of everything and it's....just plain old wrong. URGH. Thanks for the warning, though. That was nice of you. ChrisF wrote: Also the seller right below the $250 version is also selling a signed copy. There is no picture, but it supposedly has the same signing date of 3-5-07. Tell my how you verified that your book was forged. Life is a game. Keep the directions and don't lose any parts. Mountain.....Shane and Joe verified that the books sold by this seller wasnt legit. demorganakamark wrote: Mountain.....Shane and Joe verified that the books sold by this seller wasnt legit. So any recent sales by them are automatically bad or what? Please see my other post if you can find it. I seem to have misplaced it but can reference it again here: http://s831.photobucket.com/albums/zz232/MountainMan41/Joe%20Hill%20Books/ How can I get Shane or Joe to verify the authenticity of these pics. Thanks for your quick response to my earlier post. So any recent sales by kickbuttbooks are automatically bad or what? Please see my other post if you can find it. I seem to have misplaced it but can reference it again here: http://s831.photobucket.com/albums/zz232/MountainMan41/Joe%20Hill%20Books/ How can I get Shane or Joe to verify authenticity of these pics. Im sure that when shane notices the post ...he will give u an opinion. Or you can give him a PM..
Now, my own opinion, and I mean..my own opinion...is that I wouldnt buy from them because Joe has already had a round of trouble from them. and the best place to buy a signed book of Joe's is from the bookstores that he visited on his tour...thats what the majority of the people here do...thats what i do. Could someone tell me where to find the "Spoiler" button. I have looked in FAQ for info and I haven't found it on the screen (doesn't mean it's not there.) I have already made a mistake and don't want to repeat it. THere is technically no spoiler button...at least that i know of. Usually, i just do this. then post what u want. theres no set course of action. Last edited by demorganakamark on Sat Mar 27, 2010 11:11 pm, edited 1 time in total. Thanks Demo - appreciate it.